Dazzling aerial shooting that never sends you crashing back to earth. Free-to-play games often look appealing, but it’s difficult to know at a glance whether the business model is insidious and fun-ruining, or reasonable and worth pumping a few bucks into. With Freemium Field Test, we’ll take a recent free-to-play iOS game, put it through its paces, and let you know if it’s really worth your time (and money). Many free-to-play games are laid-back, casual affairs meant to fill small moments during your days—including recent Freemium Field Test picks like Uncharted: Fortune Hunter and Bejeweled Stars. But occasionally, you’ll find something a bit livelier and action-packed; the kind of game that pulls more inspiration from classic console and arcade games than the App Store. 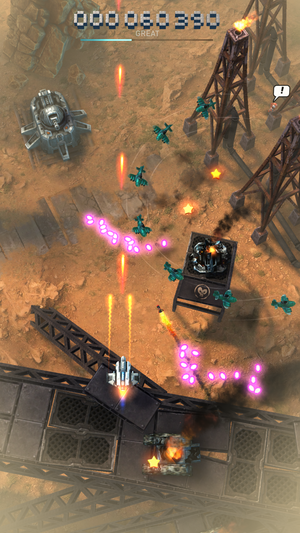 Laser bursts, enemy attack planes, and plenty of glossy scenery to take in. 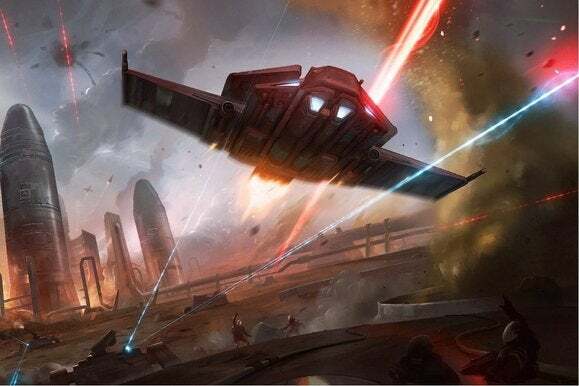 Sky Force Reloaded is one of those games, and you might already be familiar with the series: Sky Force 2014 is its great and very similar predecessor, but that’s not all. Both titles are actually enhanced remakes of decade-old vertical shooters on much, much older mobile phones, but they’ve been given both a fresh coat of paint and a free-to-play model for their new lives on smartphones. Thankfully, Sky Force Reloaded doesn’t suffer for either change. Taking its cues from classic arcade shooters like Taito’s Raiden and Capcom’s 1942, Infinite Dreams’ Sky Force Reloaded sends your futuristic airplane scrolling ever upwards as you try to blast enemy threats out of the sky. You’ll encounter rows of enemy ships, powerful helicopters, laser-firing turrets, giant robotic spiders, and more as you zip through the nine included levels. The boss battles can be tricky, especially early on when you don’t have a lot of the extra weapons. 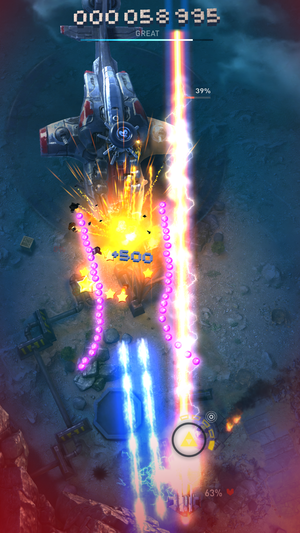 And it’s a stunner: Like its predecessor, Sky Force Reloaded features a gorgeous presentation, with impressive lighting effects, smooth animation, and plenty of detail. In fact, nearly everything about Sky Force Reloaded is just like its predecessor, even down to the menus and upgrade options. That’s not a bad thing at all in my book, but if you’re looking for a seismic shift away from what worked before, you won’t find it here. Sky Force is notably slower-paced than a lot of the core “bullet hell” shooters this genre is known for, but that makes the experience a lot more manageable on mobile as you guide your finger to maneuver the plane around attacks. And shifting the focus to completing objectives rather than simply surviving each stage, beating a boss, and setting a high score also complements that approach, too. Every level has four objectives to complete: taking out 70 percent of enemies, 100 percent of enemies, rescuing all allies by hovering over them, and finishing a level undamaged. And you’ll play each stage over and over again until you memorize the enemy patterns, find the best way to complete each challenge, and most notably, snag enough stars to upgrade your ship enough to power through. Unsurprisingly, that means you’ll have to grind a bit. You’ll earn a steady flow of stars just for playing, but the upgrades get more expensive as they go. Sky Force Reloaded is built around that repetition: You’ll probably play each early stage 10 or more times before moving on, potentially more so later on depending on your skill level, upgrades amassed to date, and how many medals you need to unlock the next mission. Luckily, each stage is only a few minutes long and it’s fun to learn the patterns and blast a bunch of beautiful ships to oblivion. But repetition is still repetitive, obviously, and all that gloss and gunning may eventually turn to tedium. You’ll gradually earn stars while playing, and in the early couple of hours, you’ll typically be able to snag a health or main cannon upgrade after every two or three level plays—and that gradual enhancement process makes it easier to blow through stages with a little extra firepower or armor equipped. 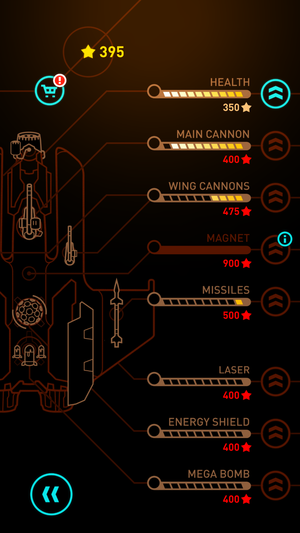 Over time, the upgrades cost more stars and progress comes less rapidly. And then later missions require more previous objectives completed to unlock. What’s great is that you can keep playing on and on with no real need to spend anything. Sky Force Reloaded has a surprisingly feeble energy system that provides 10 rechargeable lives to work with—and even when it takes 30 minutes for each plane to reload, you’ve still got a whopping 10 planes to burn through before you hit a paywall. You can pay $2 for a Planes Generator to double that maximum total, but it should be unnecessary for most players. 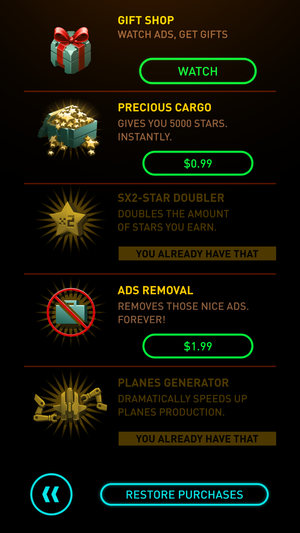 Watching a video ad every few hours offers a nice star boost, or you can buy bundles or a star doubler, for example. Furthermore, Sky Force Reloaded lets you watch a 20-second video ad every three hours to gain a big boost in stars or a power-up card, so it pays to load up the app regularly and cash in. If you prefer, you can pump in a buck to get a big bounty of stars—5,000, which is probably enough to grab enough upgrades to push you past any roadblock. Or you can spend $2 for a star doubler, which helps you more gradually amass upgrades over time. There’s also a $2 in-app purchase to kill all pop-up ads, which fill the screen every so often but aren’t terribly obnoxious. Between those last two, you can spend just $4 in the game and make Sky Force Reloaded feel more like a premium game, if you’d like. I didn’t ultimately need the Planes Generator I bought, but the $3 spent between the star doubler and a 5,000-star bundle both helped amp up the excitement enough to be worthwhile. Spending money in Sky Force Reloaded is totally your choice, and the fact that the game remains entertaining without it is pretty appealing. Reloaded can be a bit of a grind, but there’s enough gradual reward—both in awarded stars and in experience gained along the way—to keep things fun and lively even if you don’t pay a cent. And it’s hard to be critical of a game that’s so fun and polished while staying free and not being overly obnoxious with its free-to-play tactics. Whether you enjoyed Sky Force 2014 already or are coming into the series fresh, Sky Force Reloaded is easily one of the most enjoyable iOS freebies of late. And with the promise of more new levels ahead, it could continue to be a reliable pick well into the future.